Bellissimo condominio situato nel centro di Quebec City. Edificio di 3 piani, il condominio si trova al primo piano. C'è un piccolo balcone. Moderno e molto pulito. Completamente attrezzato con macchine per lavastoviglie e asciugatrice, lavastoviglie e tutti attrezzati per cucinare, biancheria e lenzuola per letti, Wi-Fi, TV e cavo. Due grandi camere da letto, sala da pranzo e soggiorno. Ideale se volete essere nel cuore della città. Non ha nemmeno bisogno di una macchina! Parcheggio disponibile a Place Québec a 2 minuti a piedi ($). Comfortable, large unit with all standard amenities. Finding and accessing the apartment was also very easy and convenient, which was especially appreciated when my arrival was delayed until 3am. What made it perfect was the location in the heart of the city, but outside of the tourist center. I found different neighborhood commercial, residential, or tourist areas when setting out in any direction as I biked, ran, or simply spent the day exploring the city on foot - the only time I needed motorized transportation was an inexpensive ~30 minute ride back to the airport! Thank you luke for your review! But it was a perfect location for a perfect guest! Come back anytime! Merci Luke pour vos commentaires! Loyer et localisation parfaits pour un invité parfait! Vous serez toujours les bienvenus! The apartment was terrific! It had all amenities, lots of space, and a great location. Natalie was a pleasure to deal with, going above and beyond. We parked our car in a nearby parkade, and hardly needed it. Would recommend this place for anyone! Thank you so much Jennifer for your review! It was so nice having you and your family in my home. Come back anytime ok? Nous avons passé un merveilleux séjour à Québec, le condo est très bien équipé (laveuse et sécheuse, ce qui est pratique pour ne pas trop charger les valises) Très bien situé centre ville et restaurants à quelques minutes à pieds. Sans hésitation nous recommandons fortement ce condo à tous. Merci Valérie et Xavier! Il faut dire que vous étiez des locataires exemplaires. Repassez quand vous voulez. Great location! Easy parking. Comfortable and clean. Would definitely stay again! 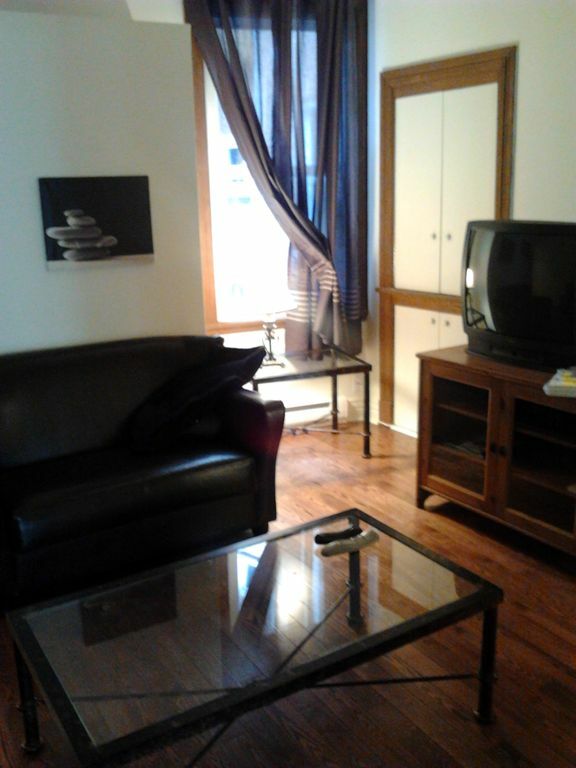 Nathalie provides a warm, comfortable apartment which works perfectly as a home base for a Quebec getaway. Located right outside the gates to Old Quebec we had easy walking access to everywhere we wanted to explore. Nathalie answered all of our questions and was very accessible by email. Our vacation stay was PARFAIT! What a PERFECT stay! The location, amenities and heartfelt hospitality made for the perfect location for our week long stay. Thank you! Potete vedere tutto a piedi! Parliement, Chateau Frontenac, Plaine D'Abramo, musei, teatri, ristoranti e molto altro ancora! Attrazioni tutto l'anno! Grandi festival e spettacoli fuori!